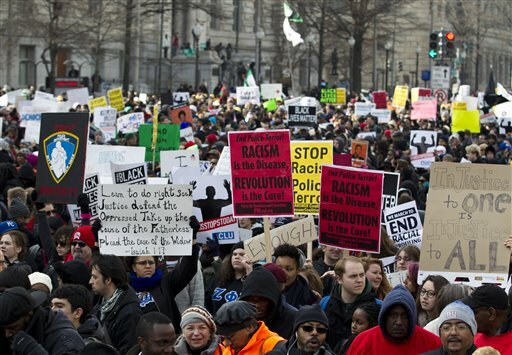 Demonstrators nationwide protesting the fatal shootings of unarmed black men killed by police chanted “I can’t breathe!” ”Hands up, don’t shoot!” and waved signs that read “Black lives matter!” as family members of three victims packed a stage in front of the U.S. Capitol, urging thousands of supportive marchers to keep pressing for changes to the criminal justice system. Nationally, chanting demonstrators also staged “die-ins” as they lay down across intersections and in one city briefly scuffled with police blocking an onramp to a highway. New York City police said two officers were assaulted by protesters on the Brooklyn Bridge when they tried to arrest a man who was attempting to toss a garbage can onto police officers below. Some marchers then blocked traffic on the bridge for about an hour. Police said the officers were treated for bumps and bruises, including a broken nose. Police say there have been no arrests in that incident, but a backpack full of hammers and a mask was found. Diallo’s mother, Kadiatou Diallo, reflected on how the same issues being debated today were debated when her son was killed more than 15 years ago. The Rev. Al Sharpton helped organize the marches. Several speakers asked the crowd to chant, “I can’t breathe.” Garner, 43, had gasped those words before his death. Some protesters also wore those words on shirts. Thousands of protesters took to the streets of San Francisco and Oakland on Saturday. Oakland police said at least 45 people were arrested for crimes such as vandalism, failure to disperse and resisting arrest following a largely peaceful protest. Meanwhile, at the University of California, Berkeley, police removed life-sized photographs of lynching victims that had been hung at the campus. Investigators believe they were connected to a smaller protest in Berkeley at noon. Berkeley protest organizers said they didn’t know where they came from. “We hope that it’s someone who wanted to bring attention to the issue,” said one of the organizers, Spencer Pritchard. In New York, the thousands of demonstrators included family members of people killed by New York City police going back decades. Others were there to show their outrage, including Rich Alexandro, 47, who carried a handmade sign with dozens of names of victims of police killings in which officers were never charged. On the eve of Saturday’s nationwide protests, demonstrators in Nashville, Tennessee, staged “die-ins” in the country music capital’s honky-tonk district Friday night while tourists took their pictures. Terry Baisden, 52, of Baltimore said she is “hopeful change is coming” and that the movement is not part of a fleeting flash of anger. D.C. Police Chief Cathy Lanier said the Washington march was peaceful. She mingled with the crowd and said she wanted to show solidarity with the marchers. “This is one of the most well-organized events I’ve seen,” Lanier said. Other groups including Ferguson Action conducted “Day of Resistance” movements all around the country.